Every now and then I come up with a recipe that turns out amazing. More than amazing. Freaking addictively delicious. This healthy sweet potato sandwich bread is one of those times. 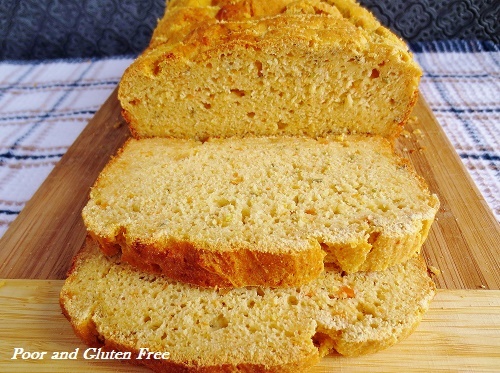 This sweet potato bread is one of those rare things in vegan, gluten free baking - delicious, perfect texture, sturdy yet soft, not chewy or gummy or dry, great for sandwiches, toast, French toast, and just about anything else you could ask for. And did I mention it's actually healthy? 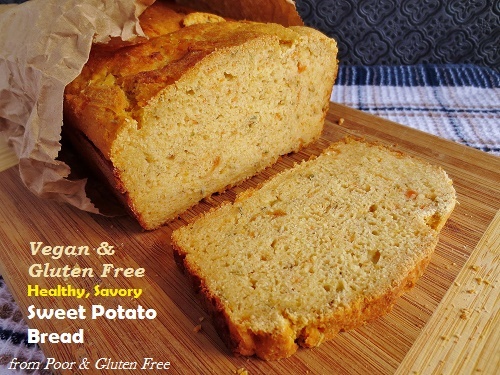 Unlike a lot of other sweet potato breads that are... well... really sweet, this one can be enjoyed guilt-free. It's low in sugar, uses a small amount of olive oil in place of tons of butter, and the flour combo includes high-protein multi-grains. 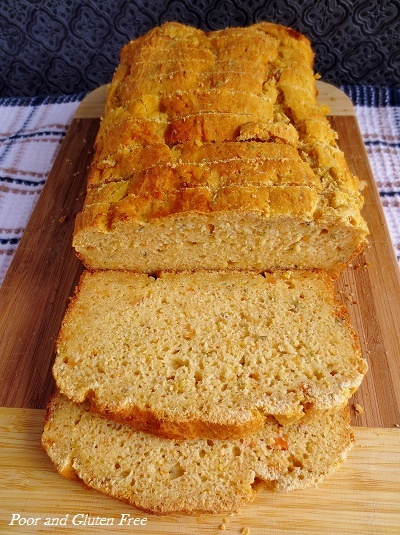 Basically, I took the savory rosemary beer bread recipe from my book Cooking and Baking with Gluten Free Beer and replaced the eggs with sweet potatoes, the beer with a combo of soda water and warm water, and tweaked things a little to get this vegan, gluten free sweet potato bread. The bread slices well, since it's porous and sturdy. I love it with savory flavours like dried onion, garlic, oregano, and rosemary, but you could also use cinnamon and nutmeg to make this a little more pumpkin-spice-esque. And as I said, it slices really well, so you can cut it up nice and thin, wrap it in a paper bag, then in an airtight container and freeze it. I like to pull out a couple of slices for toast in the morning. Preheat oven to 375F and grease a 9" loaf pan. 1. In a small bowl, mix yeast together with soda water, warm water, sugar, and olive oil. Let rest 7 minutes for yeast to proof. 2. In the meantime, mix dry ingredients in a large bowl until combined. Beat yeast mixture into flour mix, along with mashed sweet potato. 3. Scoop bread mix into loaf pan and spread evenly, smoothing the top with a spatula. Brush with a little bit of olive oil. Bake 40-45 minutes, until bread is risen, top is golden, and a knife inserted in the centre comes out clean. Let cool in pan for about 5 minutes, then transfer to a cooling rack and let cool. As I said, once cool, this bread can be sliced and frozen in an airtight container. Of course, I gobble this up pretty quick, so I can't say how long it will last in the freezer, but I'd say at least 2 weeks. 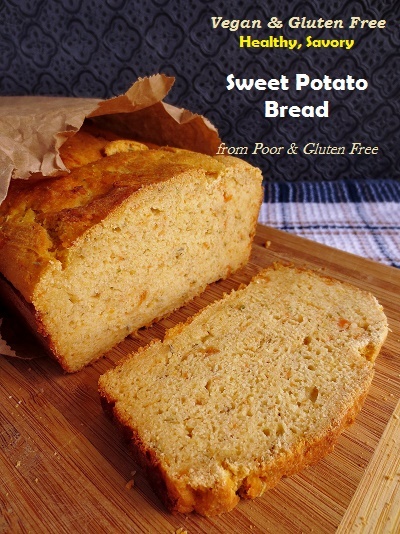 How do you like your sweet potato bread? Hello, OMG! Looks good. Do you think it could work in a electrical bread maker machine? Hi Line, I can't say for sure since I haven't tried it. It's easy enough in the oven, since it doesn't need any special kneading or rising time, so I would factor that in if you try it in the bread maker. If you try it, please let me know! Is this more like a quick bread or sandwich bread? I think that depends on your definitions. I consider it a sandwich bread, and use it as such - it's *very much* a sandwich bread texture, and it isn't at all sweet or cake-y. 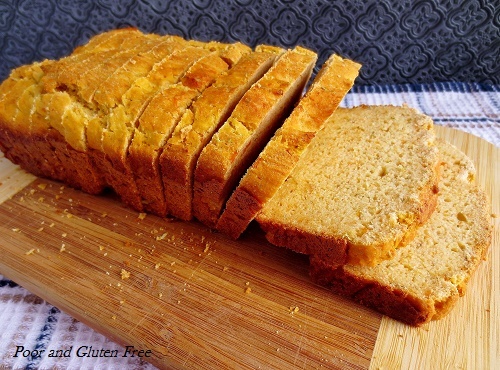 For the technical side: Unlike quick breads it uses yeast (quick breads typically don't), but no eggs and soda water (like quick bread), and no rising time is necessary (also like quick bread). I tried it. It's better to make it in the oven. For me that was bread, sandwich, cake and all in one. It's tasty and healthy. Can it be better? Thank you for the recipe.